After crossing from Mexico to Belize, we bee lined it for Belize City to grab a water taxi to the island of Caye Caulker, which came highly recommended to us. It sure did not disappoint! This tiny island (about 5 miles long and less than a mile wide) was just dreamy. The crystal clear Caribbean waters lapped on the shore of white sand beaches lined with palm trees, and the reggae tunes played from every corner store. The Rasta locals were extremely friendly and welcoming, and did not hesitate to remind you to slow down if you were walking at pace that didn’t match the slow way of the island lifestyle. We found a small, simple room for $13 total a night, so with that we rationalized the splurge for a lobster feast ($15 each, drinks included) right on the beach. The islands near Caye Caulker also have great Bone, Permit and Tarpon fishing, so we gave it a shot. Caye Caulker meets the Belize Barrier Reef, so we hopped on a boat to go snorkel with manta rays and nurse sharks. 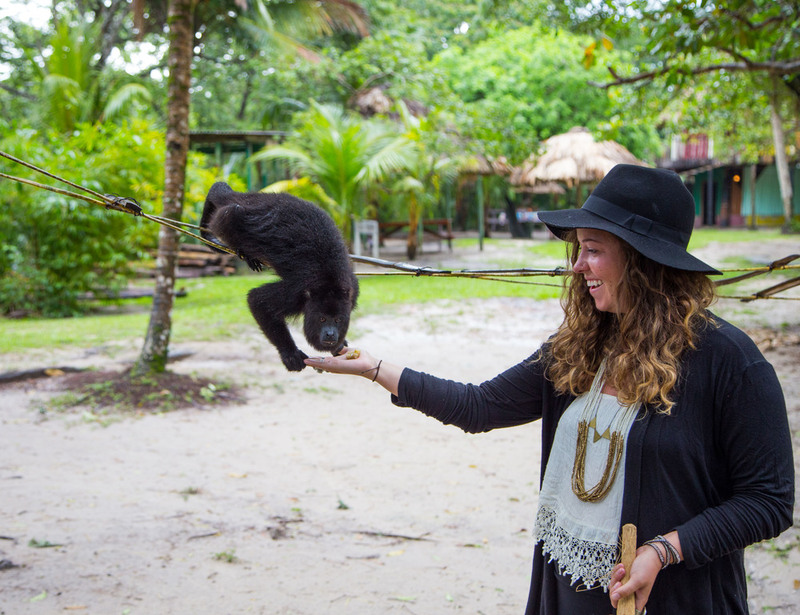 We aren’t much for Zoo’s, but we heard the Belize zoo was not to be missed, and we were accurately informed. The zoo is home to more than 125 animals, all native to Belize, and is set on 30 acres of land. What made this zoo so special is that is has completely kept the natural flora of the area intact so it feels like you are walking through the jungle. All the animals are either injured or used to be illegal pets from drug dealers. They were more accustomed to human interaction and we were able to see every animal in the zoo up close. A massive black jaguar attempting to get through the fence during feeding time may have been the highlight, or all the spider monkeys, or the harpy eagle.. there was so much to see, we only left because it was closing time. We stopped by a shop called Mad Dog Motors right near the Guatemalan border, we had heard it was owned by a guy from Brooklyn who spoke english and was trustworthy. It turns out it was a family and most of them had lived in Alaska. They gave the bus a once over and let Dillon change his own oil and transmission fluid. The Subaru engine has been pushing the bus a little harder than it may have been designed for so it wasn't shifting correctly once it was hot. We switched to synthetic fluid which solved the issue. We soon waved goodbye to the last English speaking country we would encounter and headed for the border. After crossing into Guatemala we headed straight for the ruins of Tikal. We passed a few police checkpoints which waved us through (opposite of what happens in Mexico), bought roadside tortillas (12 for 30 cents), and tried to find some salsa to match (didn't happen). We made it to Tikal late in the afternoon and arranged a tour for the sunrise at 4:30 AM, hours before the area officially opens. Living the budget life, we rarely spring for tours but the sunrise hike into Tikal requires a guide and looked too good to be missed. We woke up at 3:30 am to prepare the jungle walk with the local guide. We made it to the top of the ancient building that sits the highest to watch the sun rise over the jungle and the massive expanse of thick jungle and the tops of ruins. Not only were these ruins massive and beautiful but there were only about 10 other people in the entire area. It was no comparison to many of the ruins in Mexico, where massive crowds holding selfie sticks take your attention away from the beauty in front of you. Tessa standing on the highest pyramid at sunrise. You can see the other structures coming into view over the canopy. From here it was a full day drive to the Candelaria Caves. The Candelaria Caves weren’t in any guide books, but we saw a brief mention of them in the iOverland app we use to find camp spots, and it ended up being a highlight of our trip. The small hotel that supposedly had a guided caving trip seemed pretty light on information, so we didn’t get our hopes up. I mean, how cool can it be if the receptionist hasn’t ever done it and it’s only 15 minutes away? Luckily we were proven wrong . We hopped in the back of an old pickup with 4 other Guatemalan locals and trustingly headed into the jungle. After hiking for a bit we came to the entrance of a huge cave with a river running through it, hopped on our tubes and blindly followed the guide (literally, since it was pitch black). Our guide was pretty casual about the whole affair, but we realized with our limited Spanish and his lack of English it would have been really easy to make a wrong turn and never pop out on the other side of the mountain. After miles underground we finally emerged from the mountains. It was quite a trip. We cruised on the back of this Toyota out to the entrance. No pictures of the caves themselves! We then headed for the beautiful Semuc Champey. The road was fairly bad, at one point it tore off our radiator shield. Merman at the falls. Why no crowds? Well it's passed closing and the park rangers are about to bust us. We left Semuc Champey and headed towards Lake Atitlan. This is no easy day of driving. We took the easiest way Google told us and headed out right behind our friends XinoXano. It turned out to be very questionable. Well we followed them for a bit until google sent us on a different route. The first sign was this major landslide which wiped out the highway. Naturally we stood in its path and took pictures. They seemed to have given up on the highway as there was essentially no maintenance done until the next town 60 KM away. It turned a 5 hour drive into a 12 hour drive. Driving up over the crest of the mountain and laying eyes on Lago Atitlan is a sight we won’t soon forget. It was the first taste of home we have felt from the landscape on the trip. The lake is so large it looks like the ocean, with smaller islands strewn throughout it felt like landing in South East Alaska. And the temperatures were closer to home than we have had in a while, what a relief! We camped right next to the water and took inexpensive water taxis to a few different lakeside towns. Dillon's been loving his haircuts on this trip. The Colors in Guatemala have been amazing. Leaving Lake Atitlan we thought we would give Google Maps another try.. Google doesn’t take into consideration the road quality/size or the level of safety when suggesting a route. The road it took us on between Lake Atitlan and Antigua was washed out, had a recently cleared landslide, and was one road specifically mentioned not to take because of danger with criminals. Luckily we didn't know any of this and blindly went for it. Bridge wash out to the left. The subiebus made it no problem. As per usual the road was so bad we were chasing daylight attempting to arrive in Antigua before dark. Once we got back on a main highway we found 100 KM/H speeds suddenly meeting stand still as the four lane highway becomes two lanes trapped in town after town of jumbled traffic. The taxis and local buses stopping randomly in the middle of roads to pick up or drop off passengers will drive you mad and destroy your schedule. Eventually we did make it to Antigua where the local police station is the only option for legitimately camping in your vehicle. Here we were surrounded with other overlanders, the first time we've seen this many since Baja. The town has many expats, travelers, language schools, excellent cafe's and more, leading many people to stay here for weeks or months. It also is surrounded by active volcanoes..
We stayed a few days here, made friends with the people around us and headed for some hot springs on the El Salvador side of the border. A short 45 minute hop from the border of Guatemala and El Salvador, up a narrow dirt road, we found an established hot springs place with over 5 different pools. The bonus to camping here is that we got the springs all to ourselves at night or so we thought. An armed guard let some teenagers in around 10 PM, they just partied around the pools for a few hours and left us alone. It was just a little wake up call that it was the weekend. Luckily as part of that weekend a nearby town of Juayua was having their food festival and we indulged on some local papusas and steak. We then headed to the coast. We passed by many great surf spots, all without a single surfer around. It's tempting, eerie, and beautiful all at the same time. The surf town of El Tunco was a total gem. The tiny town has a laid back surfer vibe and lies on a river right where it flows into the ocean that was lined with perfectly polished black rocks. It has a brewery, a few breaks withing viewing distance, surf shops and everything else a surfer would need to be in paradise. The only drawback, it was unbearably hot. Springing for an AC hotel was our primary survival strategy. Dillon got some surfing in but Tessa rarely made it out of the AC haven between the hours of 9 and 5pm. Local Mural. Pretty self explanatory, aliens love to surf. We left El Tunco in search of a beach paradise closer to the border. La Tortuga Verde had good reviews both from the guidebooks and online, but when we arrived it was under renovation. They had a temporary kitchen dishing out fairly poor food, close out beachbreak, and an overall bad vibe. We had lunch and looked for other places to park for the night on the Punta Mango road, but we later learned we did not drive far enough down the road to some hidden camping spots and surf breaks. We instead decided to head for the town of San Miguel. We found a budget hotel with AC (100+ degrees out) and made a plan to hit the Honduras border early in the morning. Soon after we pulled into a secure parking area in San Miguel we were approached by a local lady holding out her phone, showing us our own Instagram. Taken by surprise as we hadn't seen a bus since Mexico we weren't expecting any followers in El Salvador. She explained her husband has a bus and they love them. She told us of a twin Westfalia her friend owns in the city, but we were headed for Honduras early in the morning and wouldn't be able to meet. Well the VW gods really weren't happy with that plan and quickly took their wrath out on Tessa's healthy body. The next morning as Tessa was wrapping herself in blankets in 100 degree heat I went to Burger King to use the Internet in order to research symptoms and hospitals. That's when @fotobuselsalvador found me at burger king and completely helped us through a three day hospital visit. It was great to get the local insight from him, and to cruise around the city in twin buses. The VW community is so strong worldwide, sometimes it takes a little nudge from the gods to help change our plans to meet the other members! He even gave us a beautiful painting of our bus! It turns out after further research El Salvador has some of the worst sanitation of any country in the world. The doctors were able to find the problem quickly after some samples, but without the hospital Tessa wouldn't have recovered. All those Papusas we ate in El Tunco, or that pour quality lunch from the temporary kitchen likely did it, and it taught us a lesson to be more careful with the local food we eat. The three day hospital stay which included three days of being attached to IV antibiotics ran about $500. We were relieved to have such a small bill as a simple visit to the hospital would run this much in Alaska. We headed for Honduras expecting the worst. El Salvador had two armed guards with machine guns at the Burger King.. we did not know what to expect in a country which is known for kidnappings and murder. We spent over two hours at the border crossing, by 10 AM it was getting very very hot, and we were free to drive through the country. The plan was to drive all the way through into Nicaragua, perhaps even all the way to San Juan Del Sur. Well the first half of Honduras went well, the roads newly paved. We stopped by a mini-mall that had a Pizza Hut, there was one armed guard in the parking lot, so far the country seemed safer than El Salvador. After a quick familiar meal we headed on, sweating profusely, getting quickly irritated with each other. We went through a few quick police checkpoints, no bribery attempts, everything continued smoothly. As the road deteriorated quite a bit we were all over the place dodging potholes. Suddenly a van pulls to our right as we are dodging some potholes to the left, an American looking fellow leans out his driver window while we simultaneously dodge potholes (more like craters) and block both lanes of traffic, in perfect English he says are you really from Alaska? We pull over and get to talking, he is also from Alaska and moved down here to start an orphanage. As traffic backs up behind us we say goodbye and continue on, we really wanted to make it to Nicaragua in one day. The border of Nicaragua isn't bad, but still it takes an hour or so. Upon leaving we find the roads to be nice, and scenic. But as we near the first town congestion begins again and we know there is no way we are making it passed Leon, if we even make it to Leon by dark. It turned out that the old town was beautiful. Finding surprises like this along the way is one of our favorite parts of traveling without doing much research before rolling into a place. We stayed a night in a really nice hostel here with a view of the beautiful clay colored roof tops then headed to Granada. Granada exceeded our expectations and is a place we would like to come back to when we have more time to spend lingering around the main square, but our plane from San Jose, Costa Rica awaited. We rolled into San Juan Del Sur which was in full party mode.You could hear techno blasting from one bar or another in the middle of they day as throngs of young adults wearing the same pool party tank tops roamed around drunk. We quickly realized the bay did not offer surfing and the town was essentially just there so kids could party. So we headed north along a dirt road. We pulled in a few bays over and found a beautiful setting to recuperate. We were able to do some haggling and get an awesome place with AC right on the beach to relax in. Our little lodge was the only establishment in the little bay, reminding us that were kind of in the middle of nowhere. Of course on the way to the middle of nowhere, down a long bumpy road there was a random police check point. I wasn’t wearing my seatbelt, since the max speed was 5mph due to road conditions. The police officer said I could go to the capital (hours away) and handle the ticket or just pay him on the spot. As his over sized aviators dangled on his tiny facial features we could smell the fear on him asking for us to pay on the spot. We said we only have $10, he said that would be enough, but we only had a $5 bill. He took it and hobbled off to his gang of police gawkers, from then on we wore our seatbelts all the time on this slow going road. We vowed never to pay anything again, but in this case it seems perhaps we were actually breaking the law. The lodge offered a perfect beach, with a cheap restaurant, one bay away from surfing. Unfortunately Dillon got a sinus infection which spread to his lungs and was on nearly full bedrest at this time. He surfed one day for a few hours but that only further wiped him out. The four days we spent here were not quite paradise as both of us were essentially recovering and the water from the tap smelled like sewage. The hot weather, low quality of sanitation and constant movement wore us down. Dillon had to go on antibiotics (70 cents for a full 10 day dosage) for his sinus infection and really needed it to be mostly gone before we left on a plane for Montana in a few days. We made the push from San Juan Del Sur to San Jose, Costa Rica in one day. However; a long border crossing full of the terminators pictured above meant the last hour was driven in the dark. Not to big of a deal in Costa Rica. We stayed a night at a Hostel near the airport, and in the morning we found ourselves driving to a family friend of Tessa's where we would leave the bus while in the states. A mile out as I depressed the clutch pedal I felt the snap as the clutch cable broke for a third time. We were in a rush, and were able to make it all the way to our parking spot in third gear. It was a strange feeling, leaving our home for the first time in six months. But as she sat there dirty battered and bruised we knew we would come back with a bag full of parts and have her driving right again once we came back. We were not so excited for the two day flight to make it to Missoula, Montana for a family reunion but we were excited to be back in the states. Where you can drink the water from the faucet, where we would get our first warm shower in months, and where you can camp wherever you want without worrying about safety.. Once we finally arrived we thought we would be so worn from traveling we would sleep for days, but rather we found ourselves breathing the fresh mountain air and flyfishing almost immediately. It was amazing to be home. So amazing that we ended up extending our stay for two months, substitute teaching, hanging out with our families and friends, and enjoying Alaska.